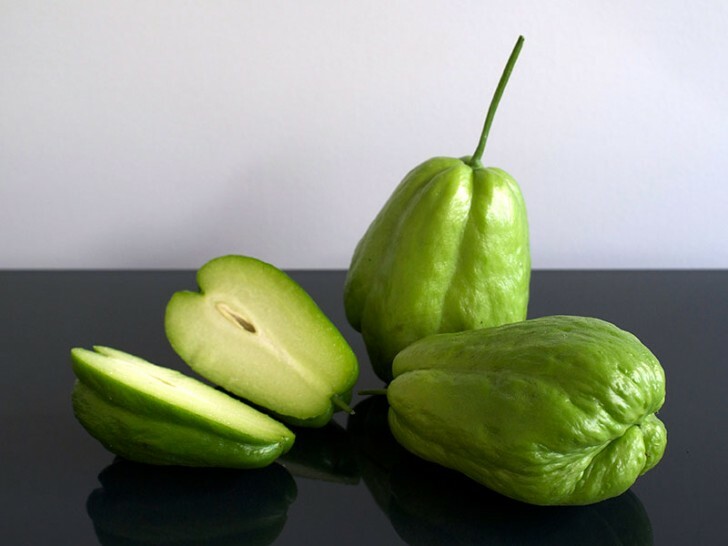 Sechium edule or Chayote comes originally from Mexico and the central American region. I have grown up with this name for it and also the common local name in NZ and Australia of ‘Choko’. It is a solid hard crunchy green skinned white fleshed fruit from a vine that grows prolifically. It is not a fruit/vegetable that you really want gnaw on raw. It has a very mild flavour which some describe as just ‘bland’. However it does work well in cooked dishes that need an ingredient in it that is slightly crunchy and has a squash like texture and that will soak up or carry and compliment other flavours. They need to be sliced or diced and cooked lightly and not boiled into ‘submission’ as I have see people do with them. When they are over cooked till soft like mashed apple they really are pretty ‘ordinary’ and almost unpleasant in taste and texture to me. They seem to be used a lot in various asian cuisines such as Vietnamese. They are really nice when combined with chili, sesame and other spicy flavours in stir fry style cooking. I have seen them prepped as desert items in a syrup too, which is quite interesting. It is a perennial vine if the climate is suitable. It will often die back for the winter period but emerge again from a tuberous root early in Spring. They can be started at pretty much any time of the year with a healthy fruit, but better in early spring. The vine is fairly easily grown by placing a fruit sideways (or larger end down) into a pot or the ground at close to surface level and waiting. The new shoots and roots both emerge from the larger end of the fruit so it just needs to be pushed in so that the earth covers the lower part. Rodents and marsupials are attracted to these so sometimes it’s easier to sprout them first inside or under cover and then cover the whole thing in dirt outside in the ground once they are readily growing and can handle a bit of a gnaw and recover from it. You can sprout them just by sitting them in a container with a little dirt in it to create a moist atmosphere around the base or growth point and sit them in a bright sunny spot. This can then be placed into a more permanent location when desired. They can GROW VERY BIG! The vines are rampant climbers so get ready for an extensive growth space being taken up. 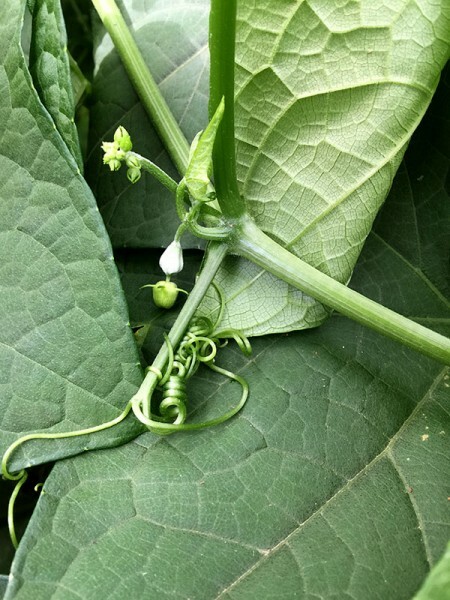 You just wait for the flowers to start forming on the ends of the vine growth points. Male flowers are in clusters and female are solitary. You can then hack them back once the flowers and fruits start to form, and you can decide where you want them to continue growing or expanding. The flowering usually happens from early summer till late autumn. The fruiting is extensive so you can hack it back a lot and still get a good crop. Here you can see a flowering point with both a female flower with fruit ready to form and a small male flower spike beginning to form above it. The tendril system you can see coming out from the bottom of the joint is pretty typical too. They are prolific growers and climbers. The quality can be variable so make sure you use a parent fruit that looks and tastes good. Some can have a lot of surface spines on the fruit and some can taste very bland and be very fibrous and tough even when young. Pick a good one to grow. They just need average water and food and can still be grown in fairly inhospitable situations in a temperate climate. Traditionally they were grown on boundary fences or up and over sheds when I was growing up. The leaves are large heart shapes and the vines are quiet dense so it’s fairly easy to identify. Apparently you can eat the leaves too but tbh i have never tried them. There is a nasty toxic weed plant vine in Australia and NZ that can be mistaken for it called Milk Weed vine or Moth Plant vine that grows pods that look vaguely like them – but the leave shape is quite different, they have a milky sap and the fruits go to seed more quickly and virtually explode with vast amounts of thistle like seeds early in the season. They are poisonous and are fairly rampant weeds so remove them if you do find them.